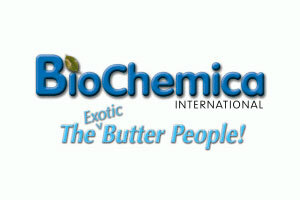 Specialist producer of a variety of butters used in cosmetic and toiletries formulations, based in the USA, and started in 1993. Offering a range of butter starting from 15 naturally derived butter, to Exotic Butter derived from a propriety process which includes Almond, Pistachio, and even Hemp seed butters, to a range of Citrus butters, Lemon, Orange, Lime etc, to a range of Extract Butter including Aloe, Lemon Grass, Chamomile and many more. In addition BioChemica has a range of naturally derived exotic oils, which offer benefits often not found in inert, synthetic or petroleum derived oils, namely the presents of phytosterols, unsaponifiables, Omega3 & 6 fatty acids which benefit the skin and hair.